Robin McBride Scott is an award winning artist who works in Traditional Woodland materials. Robin is a consultant, presenter, and teacher of performing and visual Native arts. She is one of 6 artists in 2008 to recieve a Smithsonian National Musuem of the American Indian Visiting Artist Fellowship. She is also a recepient of the Wordcraft Circle of Native Writers and Storytellers "Artist of the Year" for 2005-2006. As a multimedia artist with a B.F.A. in Fine Arts, Robin works with traditional materials such as rivercane, porcupine quill and moose hair applique, sweetgrass, and other natural materials primary in Woodland Material Culture. She is equally knowledgeable and accomplished in working silk for contemporary and traditional ribbonwork, beadwork, painting, sculpting mediums, and precious metals. Robin is also a published illustrator of a children's book "Spring Planting". 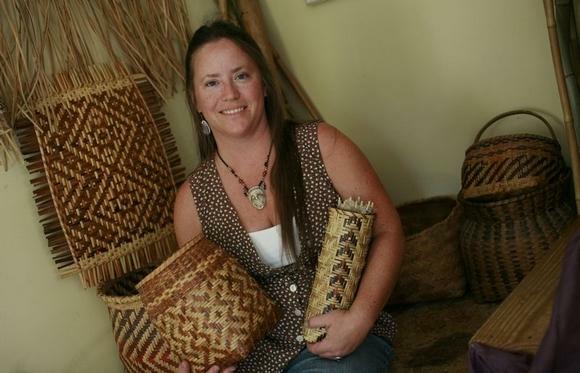 She has illustrated a baskety book entitled "Flowing Water; Weaving a Double Weave Cherokee Basket" and is the subject of a book by Children's Press, entitled, "Mrs. Scott's Beautiful Art." She tours, presents, exhibits, and teaches in museums, cultural centers schools, libraries, and has participated in programs such asWordstruck : Indiana Children's Authors and Illustrators tour, summer reading programs, storytellling and illustrator's conferences. As a consultant for cultural centers, Native American organizations and educational exhibitions, Robin has loaned her extensive collections of old and newly made examples of traditional art. She is a producer of museum quality items and credits her family and tribal elders for helping her develop her talents and gifts. "Honoring the Ancestors" is not only Robin's business name but also her way of viewing life. Ms.Scott has been a Traditional and Fancy Shawl dancer for nearly two decades and has been honored as head woman dancer at Pow Wows throughout the Midwest. Copyright 2009 Honoring the Ancestors. All rights reserved.